As promised few days back, we have come up with some festival recipes for the festival of Holi. We'll be adding more recipes of festival sweets, snacks, prashad preparation, various festive drinks and lot more in this section. Content still need to be organized further, but due to lack of available time we are presenting it, briefly edited. Images of recipes might be missing here yet, but we will be including more content and images with better organized content for this page soon. Till then enjoy Recipes for Holi Festivals. We are sure, you will be trying some of these on this Holi to make it really special for you and your loved ones. Bhang thandai is generally preferred during the Holi season. It is the highlight of the holi parties. Here is the procedure for how to make bhaang ki thandai. But drink it at your own risk. Take a pan and add 1/2 litre of water and sugar to it. Let it saok for 2 hours. Now in a separate bowl soak all the other dry ingredients in 2 cups of water for minimum 2 hours. After 2 hours grind these soaked ingredients into a fine paste. Now to this strained mixture add milk and sugar syrup. Add the cardamom powder in the milk. Keep it for chilling in the fridge for 2 -3 hours before serving. Serve it cold with some chopped almonds. 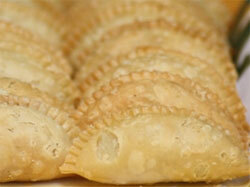 Here's a delicious mawa gujiya recipe that can be enjoyed at Holi and Diwali time and can be stored for a longer time. Learn how to make mawa gujiya. Though it looks tricky making the gujiyas but if proper procedure is followed these mava gujiyas always turn out perfect. Dry roast the thickened milk in a pan until it turns light brown and then remove it from the flame. Mix sugar, almonds, raisins and cardamom powder together. When the mava cools down add sugar to it and mix well. Add 5 tbsp ghee in the maida and rub it well in the maida with the fingers. With the help of water knead it into a soft dough. Cover it with a wet cloth and keep aside for 1/2 hour. Make about 10 small round balls of it and roll them into small puris of 7 " diameter and 1 centimeter thickenss. If you are using a gujiya cutter. Then place the the puri in the cutter and then put 2 tblsp of mava material and then close the cutter. This will seal the gujia. Now carefully take it out and place on a oil smeared plate. Repeat the same procedure with the rest of dough balls. If you are not using the gujia cutter the follow this process. With the help of of a finger smear little water on the edge of the puri and take 1 tbsp of rawa material and place in the center of the puri then fold it in a half moon shape and press and seal the edges tightly. Make sure the eadges are neatly sealed. Repeat the procedure with remaining dough balls. Now heat ghee in a pan on medium flame and then deep fry all gujhiyas at low flame from both the sides till light brown. Do not place more than 5 - 6 gujias at a time. When the gujiyas start floating on the top turn them. Keep turning them every five minutes to get even brown color on all sides. Take them out on a kitchen napkin with the slotted spoon and the mawa gujiya are ready. Dahi bhalle is the most delectable and liked chaat in North India. Dahi bhalla is made of fried lentil balls served with yougurt and some chutneys. Learn how to make dahi bhalla. Soak the dal for 2 hrs in water and keep aside. Then take out extra water and add all the ingredients of the bhalle except oil and grind it into a mixture. In a kadai heat oil for frying. Now take a tablespoon of the mixture on your palm and then flatten it out. Place some filling in the centre. Now with the help of water close the sides of the mixture on the hand. It should look like a half moon. Place them in the hot oil and fry then till golden crisp. Now dip them in some water for ½ hour. Beat the yogurt and add milk and sugar to it. Gently squeeze water from the bhalle and place them in half the beaten yogurt mixture. Now in a serving plate lay out the dahi and bhalla and then pour some beaten dahi on them and sprinkle some jeera powder and black salt powder and some sweet tamarind chutney. Crispy palak bhajia are made with fresh spinach leaves mixed with besan and various spices. They taste great when topped with chaat masala, sliced onion and green chutney. These crispy palak bhajiya are a perfect snacks and are quick and easy to make. Learn how to make palak bhajia. Take a big mixing bowl; add besan, red chili powder, cumin seed powder, grated ginger, turmeric powder, asafetida, baking soda, rice flour, salt and smoking hot oil. Adding rice flour and hot oil makes the pakodas crisp. Mix all the ingredients well and add chopped spinach leaves. Mix well. Now add water little by little to make a thick consistency mixture. Heat oil in a frying pan or kadai and then with the help of a spoon or wet fingers drop small balls of the mixture in the oil. Deep fry in hot oil and turn them occasionally to fry evenly from all sides. Note : Do not fry the bhajias on high flame as the mixture will remain uncooked from inside. Also do not fry on very low flame as the bhaiyas will absorb excess oil. Repeat with the remaining mixture to make more bhajias. Drain on absorbent paper and serve immediately topped with chaat masala, chutney and sliced onions. Ram ladoo is a wonderful snack item. Ram ladoo is prepared from mixer made from yellow lentil and Bengal gram. For this special spicy and tangy green chutney is prepared and finally topped with grated raddish. Learn how to make ram ladoo. Wash the dals and soak them separately for 3-4 hours. Remove the water completely and put them in a grinder to make a course paste. Keep adding little amount of water while grinding to get a course paste. Make sure you do not grind it to a fine paste. Mix both the lentils in a bowl and beat them together till the mixture gets fluffy and light. The color of the mixture will change from yellow to white in color. The mixture should have a dropping consistency so as to make round balls. A simple consisteny check - drop a small ball of beaten dal mixture in a bowl full of water if it floats up to the surface it means the mixture has desired consistency. Now add salt,red chili powder, green coriander, ginger and chopped green chilies to the mixer with a light hand. Take oil in a frying pan. When the oil is hot, reduce the flame. Now take out 1 tsp of batter with wet fingers, give it a round shape and gently put it in the oil. Place as many as possible at a time. Fry these balls on medium flame until they turn golden in color. Place an absorbent paper on the plate and take out the ram laddu on it. Take all the ingredients of the chutney in a mixer and grind them into a fine paste of dripping consistency. Serving : To serve place 5-6 fried ram ladoos on a small plate and put some grated radish on them and pour the green chutney on top. Squeeze some lemon juice and sprinkle some rock salt and serve with a toothpick.